Sea, Sand & Sky: Fun had on the Harbor! As we near the midpoint of our summer with Save The Harbor, we continue to have fun at Piers Park, Courageous Sailing, and Community Boating Inc. Although no fish have been pulled in on the lines at Piers Park, a great abundance of invertebrates have been reeled in. 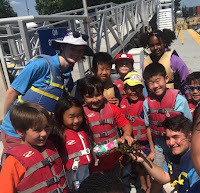 We got to see our second legal sized lobster of the summer after one of the harbor explorers managed to bring one onto the dock. This individual was a female, so we released her back into the harbor to make more lobsters for future generations to enjoy. Crabs have been the most abundantly caught creature on the fishing rods, with green crabs being the most common, with the occasional rock and spider crab. Often times the crabs will make their escape before being swung onto the dock, much to the dismay of the kids. The crab and minnow traps produced the usual additions to the touch tank, including green crabs, cunner, and rock gunnels. However, we added a sculpin to the lists of species caught this week. A Forbes sea star was found in the rocks and drew the attention of many of the kids. green crabs which were still exciting to see. 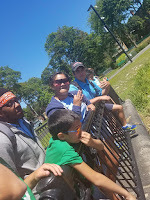 We did salinity stations one week which allowed us to explain how the Charles River empties into the harbor via lochs close to where the sailing center is. We taught them how the addition of more freshwater to saltwater would lower the salt content. The next week, while on the floating dock, we got to see the result of the Charles River lochs being opened when a dead largemouth bass floated over to where we were fishing. Our time was cut short on Tuesday at Courageous when a mean looking storm system made its way to us. only tested the knowledge of the kids, but it also allowed them to learn more about their local environment and how to better protect it. We also led an environmental science themed nature walk around the CBI property. Pulling up an eel trap produced a juvenile largemouth bass which gave us the opportunity to teach about the food chain present in a river ecosystem. A pair of sunfish nests allowed us to talk about behavior of breeding fish. 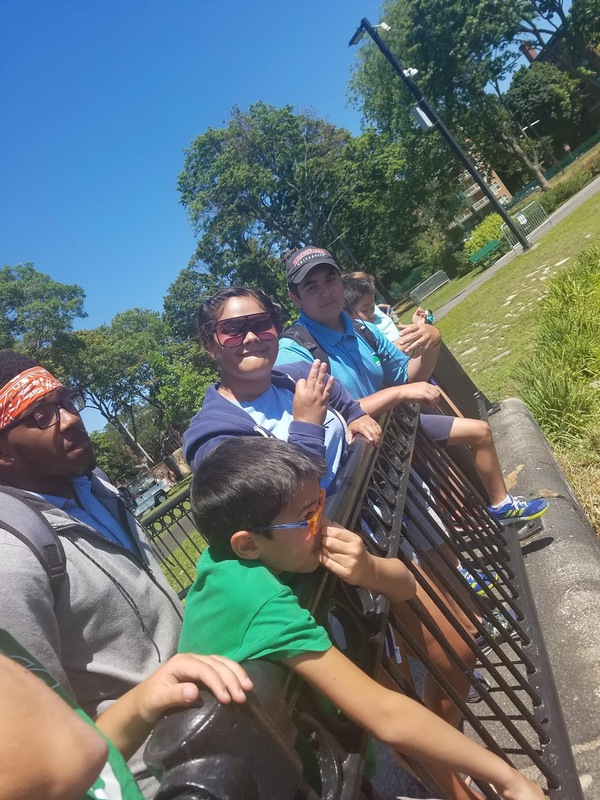 While on our nature walk there was a passionate discussion about how we are damaging our environment and what steps we can take as a society to resolve this. 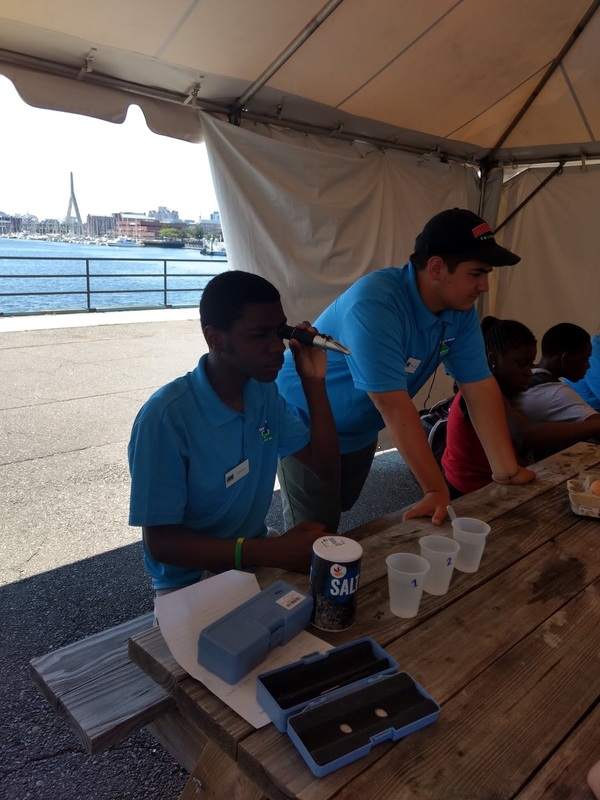 This past week I had the opportunity to work a beach event at Constitution Beach in East Boston. We brought a couple of flounder with us and set up a station for fish printing. Many kids came over to create art and talk about the flounder along with many other organisms in and around the harbor. 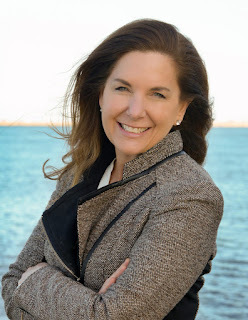 It has been a great couple of weeks so far with Save the Harbor! Although I will be gone next week, I’ll be excited to get back and see what that week holds!